Chimaera – THINK IT, BUILD IT, PLAY IT! “Decentralised Autonomous Universes” Imagine countless millions of players competing and cooperating in decentralised virtual realities that run serverless and unstoppable. In provably fair environments, they use their skill and intelligence to harvest resources and acquire rare artefacts that hold significant real world value. What if developers could provide autonomous, decentralised worlds, rich in tradable virtual items for gamers? What if developers could go from concept to game release in less time and for less money without worrying about infrastructure costs (such as servers) and recurring costs (such as account administration)? What if we could offer true ownership, simple and safe trading methods for gamers to convert virtual items into real world value through an entirely flexible system? What if both gamers and developers could share in a win-win outcome with both able to capitalise on new revenue streams and participate in thriving new economies? What if we could realise a substantial and growing demand for a cryptocurrency, increasing its utility and value for users? What is being proposed here is gaming using the blockchain to provide a secure, decentralised, autonomous, and flexible platform upon which a variety of games can be built. Huntercoin was a proof of concept to develop solutions to the technical challenges and to test the market. Huntercoin was successful and within just a few months of launch achieved over 35,000 simultaneously controlled characters3 in the game despite a low profile launch, and despite requiring some specialist hardware (i.e. solid state drives, which were uncommon at the time) and a reasonable level of technical know-how from the gamer. Huntercoin was largely autonomous and required no servers or other infrastructure. It achieved a market capitalisation close to $1 million within just a few weeks and peaked to around $6.3 million in 20174 . The Huntercoin experiment served its purpose several years ago, and this ‘hobby project’ provided a number of world leading insights into blockchain technology, including publication in the blockchain journal ‘Ledger’. The Chimaera platform builds upon the significant know-how developed across Namecoin and the Huntercoin experiment and will provide a wealth of tools and infrastructure for game developers to build their own game worlds that fit their vision and project. 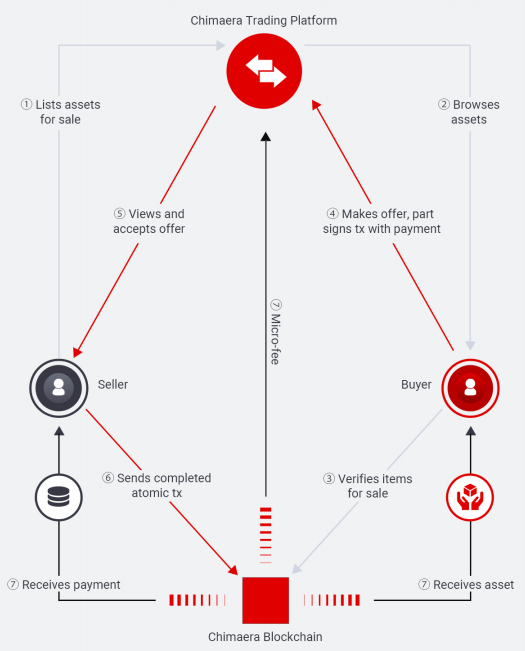 They can fully leverage the Chimaera technology to build decentralised games and issue their own game currency that can be traded for ‘CHI’ or other Chimaera game coins or assets. The assembled Chimaera team is comprised of the original creators of blockchain gaming, experienced developers, and blockchain and business experts. So whilst this is a new frontier, the assembled team has the experience, insight, and initial designs available to readily solve the challenges ahead and realise game-changing blockchain technology and a whole new ecosystem. Chimaera addresses both the existing gaming and cryptocurrency markets and further creates an entirely new market in the process through games created on top of the blockchain. This new market is attributable to the creation of new virtual universes and item trading possibilities that are substantially deeper and more flexible than other emerging and simple trading systems using smart contracts. Chimaera targets both developers and gamers. The Chimaera team aims to empower a large proportion of new developers who find taking their game visions to market challenging because of time and financial constraints. In this sense, Chimaera aims to democratise game development. Through the creation of a virtual item trading and sharing platform, the Chimaera team aims to allow players to generate real world value or capitalise on previous gaming achievements in new games through the trade of virtual items from one game to the next. This is achieved through the adoption of Chimaera tools and applications by gamers and existing developers and studios. The following sections describe the gross magnitude of the existing markets, all of which will be addressed through Chimaera. The general message, however, is a consistent one, inasmuch as there are significant opportunities and potentially billions per annum of opportunity. Player numbers for both subscription and freemium model games tend to be measured in the millions for some of the leading games. World of Warcraft for example had circa 12 million subscribers in 2011. Freemium models have emerged as a significant means of generating revenue. They allow players to play for free or pay in order to improve their performance within the game (e.g. ‘levelling up’, or acquiring ‘power ups’). The models are essentially supported by advertising revenues and in-app purchases made by players. By means of example, the Clash of Clans strategy game for mobile devices achieved over $45 million a month in revenue with some estimates suggesting as high as $150 million a month. Arguably one of the emerging biggest growth areas within computer gaming is from the populous Asian countries (e.g. the gaming market in Asia Pacific is growing at over $4.7 billion per annum). As a result, any solution proposed should consider accessing these markets through tailoring of the solution to meet cultural and other sociological needs. Our potential inside the gaming market initially consists of the approximately 75% of all gamers who play on mobile and/or desktop platforms. We are not initially pursuing other non-gaming markets that Chimaera is also technologically well suited for, but this might be a long term aspiration.